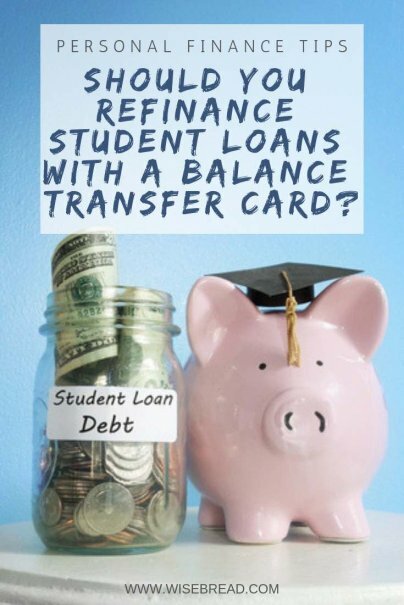 Home » Personal Finance » Debt Management » Should You Refinance Student Loans With a Balance Transfer Card? As of early 2018, the average student loan debt for 2017 graduates was $39,400. That's a 6% bump from the year before, notes Student Loan Hero. Collective student loan debt nationwide is also up to $1.48 trillion across 44 million borrowers. With stats like these, it's no wonder students are struggling to repay their loans and defaulting at record pace. But what's a student to do? You can stick with the program and make regular monthly payments on your current loans until they're gone, for starters. You can also sign up for an income-driven repayment plan that lets you pay a percentage of your "discretionary income" for 20-25 years before forgiving your loans. Or, you can sign up for an employment-related forgiveness program such as Teacher Loan Forgiveness and Public Service Loan Forgiveness (PSLF). Some students even refinance their student loans — usually to secure a lower interest rate or lower monthly payment. There are notable disadvantages for doing so, however. For starters, you lose federal protections such as access to income-driven programs, and forbearance when you refinance federal student loans with a private lender. Interest rates on federal loans tend to be fixed while private loans tend to be variable, and this could pose a problem in a rising interest rate environment. Finally, private student loans are never subsidized whereas certain federal loans allow the federal government to pay the interest on your loans while you are in school on at least a half-time basis. With few reasonable options to consider, some students may be lured into consolidating student loans with a balance transfer card. The reason is simple: Balance transfer cards come with 0% APR for anywhere from nine to 21 months, which means indebted borrowers could pay down their loans with no interest during that time. According to Michael Lux, an attorney who has spent five years advocating for student loan borrowers at The Student Loan Sherpa, this is rarely a good idea, even though he could see it working out in "very limited circumstances." Your student loan lender may not allow you to make payments or transfer a balance to a credit card. However, several banks let you transfer a balance from student lenders. You'll have to check. You lose federal protections. Like with refinancing federal student loans with a private lender, you lose federal protections like deferment, forbearance, and access to income-driven repayment when you refinance federal loans with a balance transfer card. You may pay higher interest rates over the long-term. While balance transfer cards come with 0% introductory offers, these offers don't last forever. The average interest rate on all credit cards is over 17% right now, which is a lot higher than the ongoing fixed rate on federal loans. There are fees involved. Some balance transfer cards charge a fee equal to 3% - 5% of your balance upfront. This works out to $300 to $500 for every $10,000 you transfer. It's risky. Student Loan expert Ben Luthi of Student Loan Hero says pursuing a balance transfer offer to save money on interest could leave you worse off if you don't pay down your balance before the offer ends. "The chance of using a 0% APR promotion is enticing, but if something goes wrong, you could end up in a bad situation financially," he said. Also, missing a payment during your card's 0% introductory period could mean losing your 0% APR promotion. While there's risk involved in transferring a student loan to a balance transfer card, it can make sense in very select circumstances. For example, it could make sense if you're down to your final $10,000 in student loan debt and fully committed to paying $555 per month to have it paid off within the 18 months you get 0% APR. Another time transferring student loans to a balance transfer card can make sense is if someone is expecting a windfall and wants to save on interest in the meantime. "This move could work for someone who will be getting a large bonus at work in nine months," said Lux. Another example is if a borrower has a CD or bond that will mature at a set date and a balance transfer card can be used to pay off the student loan while the student awaits their money. Still, it's not so clear if you're paying a balance transfer fee, says Luthi. If your balance is small, say just a few thousand dollars, savings resulting from the 0% APR offer may not even outweigh the balance transfer fee. For this reason, you should run the math to see if transferring a balance will actually save you money before you pull the trigger. While there are certain situations where a balance transfer card can be used to save money or pay down student loans faster, this is usually a losing proposition. The fact remains that these cards offer 0% APR for a limited time, and after that, you'll pay the regular interest rate. Since federal student loans offer low fixed rates, paying student loans at a card's regular interest rate can cost you a lot more over time — even after accounting for money saved during the initial 0% period.